High-performance night vision weapon sight allows you spot and sight targets that would otherwise be concealed by darkness. ATN's "Red-On-Green" reticle with illuminated red center dot provides a clear aiming reference for targets out to approximately 300 yards in full moonlight. One-knob operation and automatic brightness control makes this weather-resistant unit easy and straightforward to use. Detachable 450mW infrared illuminator provides additional illumination for a higher-contrast image when ambient light is at a minimum. Attaches easily and quickly to Picatinny or Weaver-style rails. 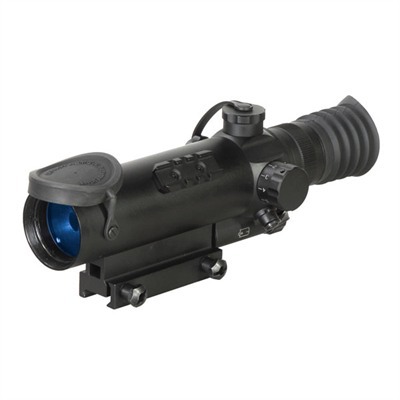 Available in 2x, 4x, or 6x magnifications with a choice of Standard Gen 2 tube o Mfg: Atn SPECS: Molded hard-polymer, black. 11" (28cm) long x 4.1" (10.3cm) wide x 3.7" (9.3cm) tall. 3.1 lbs (1.4kg) wt. Fits Picatinny and Weaver-style rails. Photocathode type: Multi-Alkali. Green display. Focus: 10m to infinity. 30 hour battery life. Water/fog resistant. Operating temp.